My lovely little monster is fully recovered from his nasty gastrorentiritis bug and tonsillitis - he was such a poorly monkey, and I was worried sick about him - the trip to A&E is up there with the absolutely worst moments of my life, so I'm really relieved all is well and he's back eating, drinking and causing mayhem. Unfortunately, this week has seen a nasty bout of teething and Bert has produced the hugest front tooth - bless him. It is quickly being followed by the next tooth, and he is pretty grizzly and clingy...cue tired mummy grinning through gritted teeth armed with Calpol and a homemade ice lolly. I'm happy to announce that I am now working alongside the fab NUK- a baby supply online store with over 50 years experience of developing products for our little ones. One of their ranges is in association with Annabel Karmel, who for those of you who haven't heard of her, is a baby feeding/food/weaning specialist. She's written lots of recipe books for helping you to feed your wee one with a healthy balanced diet, what she doesn't know about feeding babies isn't worth knowing! 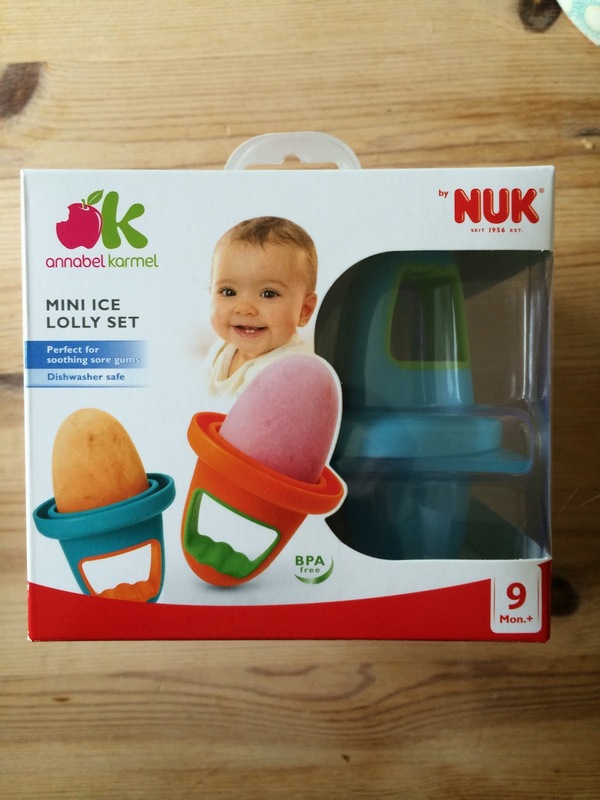 NUK sent me the fab Annabel Karmel Ice Lolly Set priced at £6.99 to try out, and it couldn't have arrived at a better time. A cold lolly really helps to soothe Bert's gums, and the relief lasts so much longer than just giving him a cold teething ring, as he loses interest in them very quickly - funnily enough, when something is food-based he doesn't lose interest - I wonder where he gets that from? 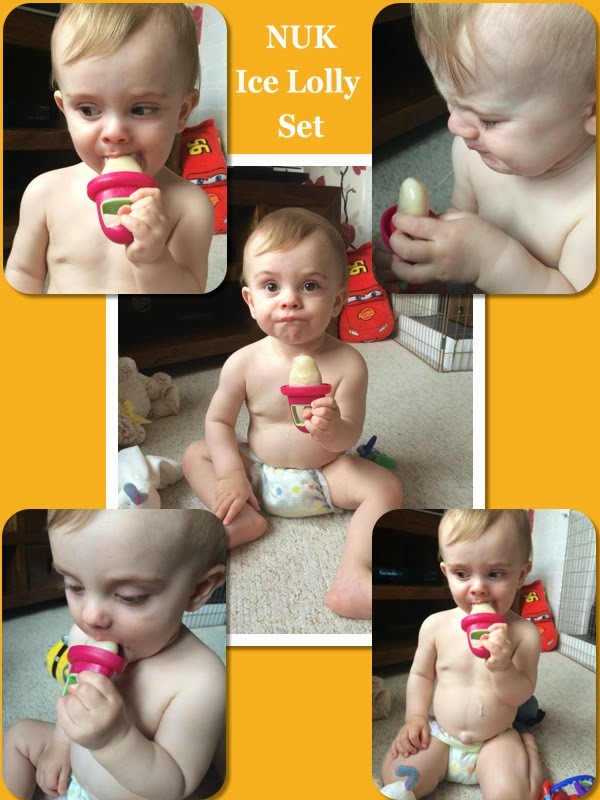 The ice lolly set is fab - it comes with four moulds, with chunky handles which are super-easy for babies to grip. The lolly size is nice and small - which makes them perfect for little mouths, and means they don't take an hour to eat, melt EVERYWHERE and cause a complete sticky mess (I've totally been there before using a larger lolly mould set that I have from Ikea). 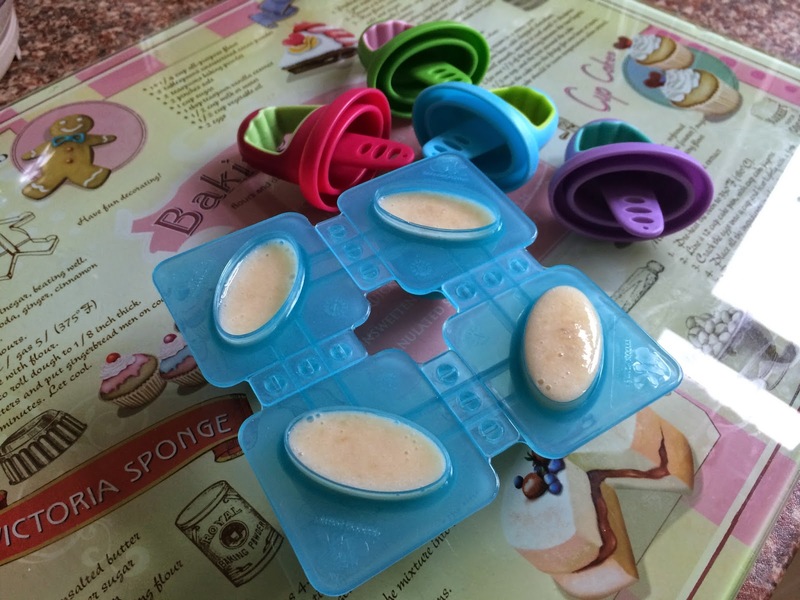 The individual moulds clip together, or unclip singularly, which is great if you only want to pop one or two in the freezer, and means they can squeeze into the smallest freezer space, always handy! It has a lovely bright colour-way which is sure to help entice your little ones to try a taste of whichever lolly you've made them. I made Bert banana lollies (his favourite) which just consist of fresh bananas with a splash of his baby milk all blitzed up in a food processor, poured into the moulds and then frozen. This means they're super-healthy as well as being soothing and fun for Bert to eat. You could make hundreds of flavour combos, and get loads of fresh fruit into your wee one this way. 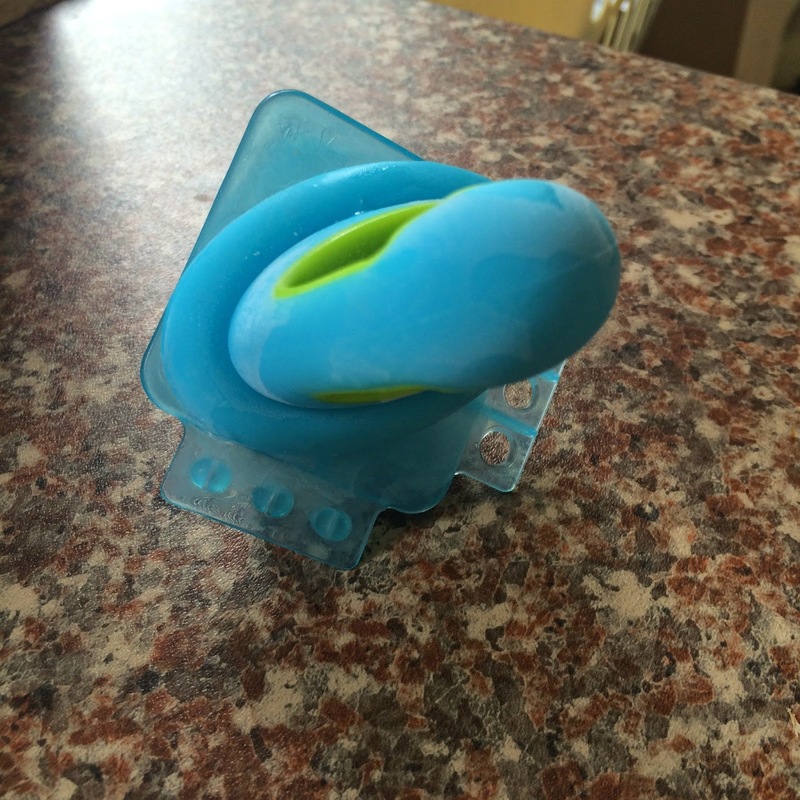 I really am so pleased with this lolly set: it is such great quality for a very reasonable price, and it has great functionality - NUK have thought about every element of this product to ensure it works perfectly, and does the job intended to the best of its ability. Anything that helps soothe Bert's sore gums is a winner for me right now! The Bertster having a good chomp on a nice cold banana lolly. 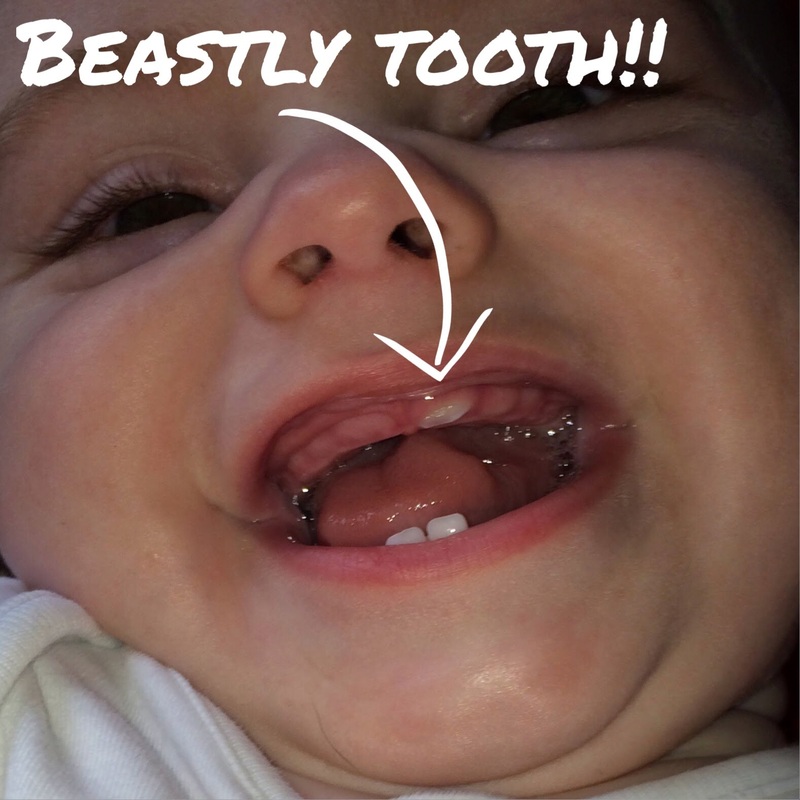 Any other parents out there battling the dreaded teething at the moment? Have you tried lollies to soothe their pain? If not, why not give these a go? I have a lovely discount code for you guys to use online which will give any of my lovely readers 25% off of NUK products: just enter MRSBISHOP25 at the checkout. Disclaimer: I was sent an ice lolly set for the purpose of this review. All words, opinions and images are my own.